We're very excited to announce that Panama Fleets' debut full-length album, 'Data Melt', is out now! The release is also available to pre-order on cassette in a limited run, so be sure to grab yourself a copy! We're delighted to announce that "Tales From The Shadowlands" by Understated Theory, is OUT NOW! The album is available as a digital download as well as a limited edition CD. 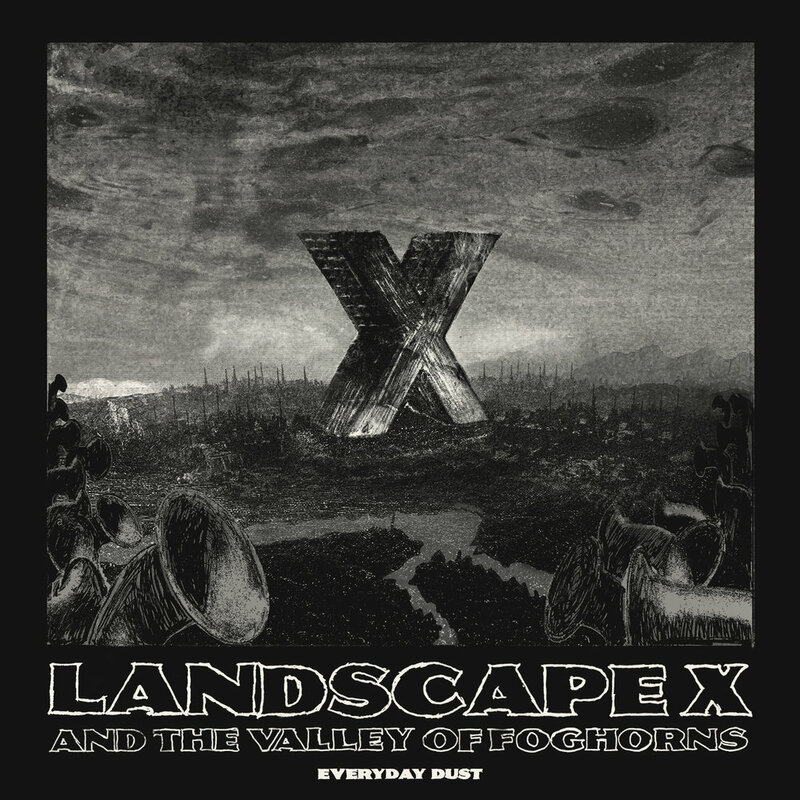 We're extremely excited to announce that Everyday Dust's third full-length album, 'Landscape X and The Valley Of Foghorns', is out now! The album is arguably a soundtrack with no film. A wash of analogue synthesisers, industrial drones and burbling electronics - with more than a nod to avant-garde film scores, early Tangerine Dream and 80s horror soundtracks. Available as a high-quality digital download, and to pre-order on cassette, accompanied by a handmade booklet package. We're happy to announce, in collaboration with Northwood & 4, that Of Verandas' self-titled debut album is out now! The release is available a digital download, as well as a limited edition CD, so be sure to secure yourself a copy! We're very excited to announce that 'Further Studies Beyond Decay'; a compilation of new Everyday Dust material and remixes from 'The Green Decay', is out now! The release features contributions from An Imaginal Space, Panama Fleets, MODAL PLANE, John Lemke, M I I I I M, SpectrumShift, Dead Melodies and Monotronaut, all hand-picked by Everyday Dust in order to present a multifaceted and compelling resynthesis of 'The Green Decay'. Today we, and Northwood & 4, are very happy to announce that the mini-album 'Kelbach - Ohio Route 2' is out now! The release is available a digital download, as well as a limited edition CD, inclding a lovely booklet featuring photography by Kevin Kelbach. Exciting news comes sweeping in with the North Atlantic drift today, as nil.co returns with his second full-length release through Sparkwood! nil.co's most daring outing in sound to date, is aptly titled "North From Nowhere", and is available as a digital download, as well as a limited CD edition. Some of you might have seen some posts or read some threads the last few days, concerning a former artist on our label, who used the name eyesix at the time. After three eyesix releases with us, we agreed to end the collaboration in early 2015. He then went on to start Eyesix Records and used new artist names, but mainly, Any Colour You Like. Recently, it has come to light that a significant part, if not all the music he signed his name to, is in fact the works by various other artists, and were simply lifted from their Soundcloud, Bandcamp pages, etc, and then re-titled. It's not been confirmed that 100% of the eyesix material we've released has been produced by other artists than eyesix himself, but we think it's safe to assume that this is the case at this point. Either way, we've decided that all 3 eyesix releases in the catalog, no longer will be available on our Bandcamp page, and hopefully anywhere else as well, eventually. However, for the purpose of possibly identifying more stolen tracks and figure out who actually created/own the music, we've decided keep the albums up for 'streaming only', a bit longer. Anything that can help us in this regard is much welcome and will be appreciated. We're on the case, in addition to others, directly or inderectly effected by these deceptive and totally unacceptable actions. We'll do our best to make things right with the actual artists, as well as those who supported the releases. And hopefully, we can help prevent this shocking case of plagiarism to continue any further! There are definitely owls in the Roadhouse tonight, and we're very excited to announce that 'Caustic Noir' by Cinereous Mire is out now! Over the last couple of years we have witness it slowly taking shape, mutate, grow larger, and it all has culminated this Hallow's Eve; the perfect soundtrack to a horror movie not yet made. We rejoice the timely arrival of "The Green Decay" by Everyday Dust. The release is also available to pre-order as a limited edition cassette, so be sure to reserve yourself a copy! Welcome to "Camp Blue Pines"
We're thrilled to announce that "Camp Blue Pines" are now officially opened to the public, and we hereby invite you to experience a cross-pollinated landscape of wild growing sounds, serene atmospheres and curious timbres seldom heard before now. The compilation features previously unreleased tracks from Scyye, nil.co, Dead Melodies, Utu Lautturi, Above, Convenience Store, Understated Theory, Kelbach and more! Panama Fleet's "Last Outpost" is now open to visitors! With the summery tones of Panama Fleets as a backdrop, Sparkwood is taking a short vacation. We hope you've enjoyed the releases we've presented during the first half of 2016, but there's much more on the schedule for the rest of the year too! We're also taking the opportunity to thank everyone who supported, shared and listened to what we had the pleasure to put forth. Thanks! We're thrilled to announce that 'Parallel Existence' by Dead Melodies is OUT NOW! The album is available as a 24-bit digital download, as well as a limited physical edition. The day has finally arrived, and we're very excited to announce that "Slowly Comes the Morning" by nil.co, is OUT NOW! OUT NOW: Together with Northwood & 4, we're proud to present "Adrift" by the Columbus, Ohio-based artist O(f)verandas! The EP is available as a digital 'name your price' download, featuring original artwork, also made by O(f)verandas. So be sure to give it a spin and secure yourself a download! It has finally arrived! "Rites Lost" by Dronny Darko & Utu Lautturi is available as a high quality 24bit digital download, or just mp3's if you prefer the convenience. There is also a limited CD edition shipping out next Monday. In collaboration with our new ally Northwood & 4, we're very excited to announce that "Autumn EP" by Kelbach is OUT NOW! The EP is available as a 'name your price' digital download, so be sure to check it out for a dose of introspective and organic ambient post-rock! A new alliance has taken shape and we're pleased to announce that 'Northwood & 4' from now on will serve as the "US branch" of Sparkwood. On this occasion, we can also share the news that the first release out of this collaboration is due out very soon! 'Two Zero Five' is Berlin-based producer and multi-instrumentalist Danny Srp's second full-length album and most extensive work to date. With a playtime little over an hour, it contains 21 tracks, which can be devided into 4 abstract chapters; Waking, Fading, Striving and Finding. Beginning a new season and spectacularly so, we're proud to present 'Subtle Imperfections' by Dead Melodies! Also featuring the alluring vocals of Oneira, so be sure to give this one a listen!